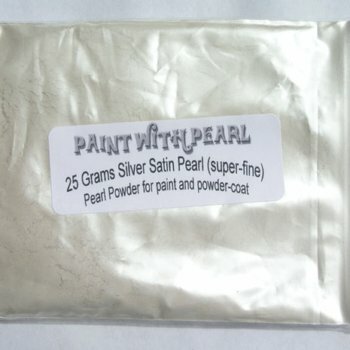 Platinum Silver Crystal Ghost Pearl – 1600 Degree Temperature Threshold, Great for paint, powder-coat, concrete sealer, pottery glaze, and any other clear sticky liquids. Makes an ultra flashy look without being glittery. Mixes will with all clear mediums, including paint, powder coat, concrete sealer, industrial epoxy coatings, pottery glaze and nail polish. Basically, any other clear medium that you can possibly think of, including plastics manufacturing. It is a large and flashy particle that is transparent, so the base color is seen through it, while reflecting it’s own color under direct light. These particles are micro-encapsulated in titanium dioxide, which is known for it’s sunscreen type UV protection abilities. 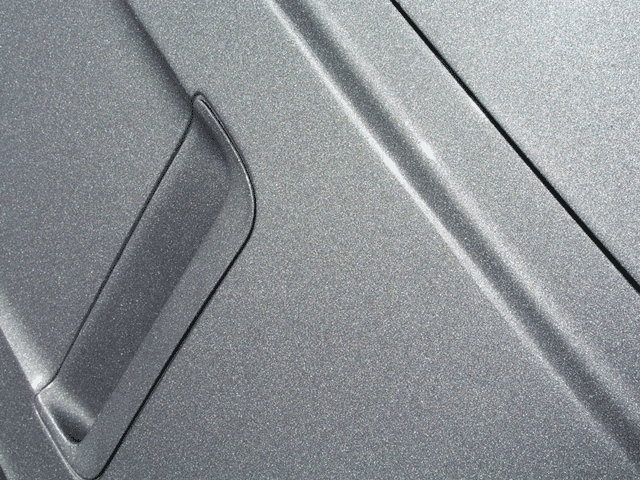 This Platinum Silver Crystal Ghost Pearl is temperature resilient to 1600 degrees F, making it safe to use in high temperature applications, like pottery glaze, powder coatings. Still a small enough particle to spray through most standard nozzles, from airbrushes to HVLP paint guns and powder-coat guns. Very light, and will stay mixed in liquids without settling too fast-stays suspended in all types of clear. Use to your liking, making full crystal effects to a more subtle, sparkle effect. 1 25 gram bag can treat up to a gallon of clear, depending on your preferences, but we suggest using 1 teaspoon for each sprayable quart for starters. High weather resistance, because it is not dyed with colors. It is perfect for any paint or powder coating jobs and will last longer than the actual medium that it is sprayed or applied in. 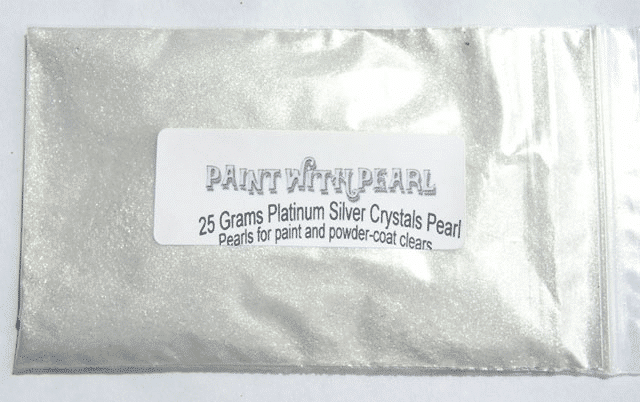 This Platinum Silver Crystal Ghost Pearl will last longer than the paint it is sprayed in. Like our other Ghost Pearls, it will literally last forever. 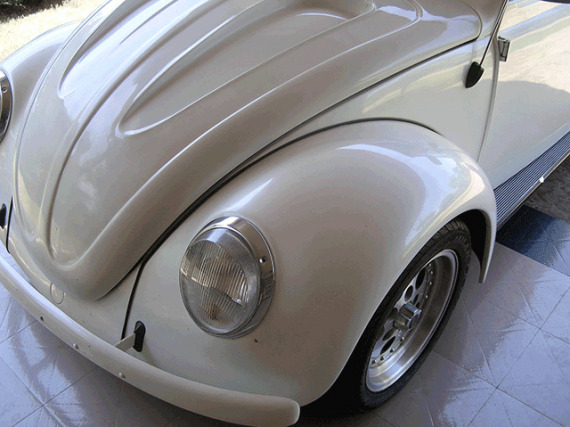 Platinum Silver Crystal Ghost pearl is widely used in today’s luxury sedans and custom rods/choppers. Platinum Silver Crystal Ghost Pearl is a larger particle than our normal Ghost Pearls. 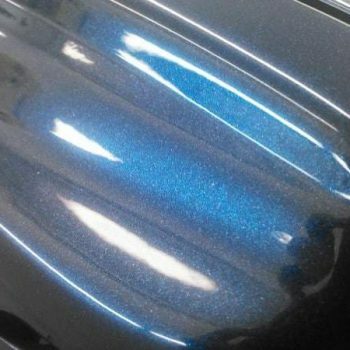 It is more flashy and reflective than our ghost pearls, and can give a great effect without making your paint have that “Flake” look. Not only are all of our Ghost Pearls completely compatible with dip or other coatings! We were the first to supply the dip companies with pigments. 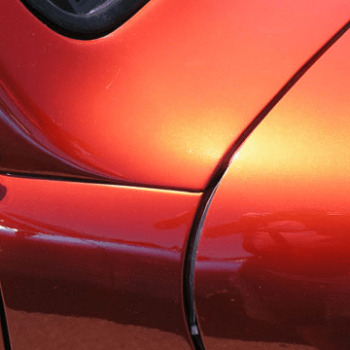 If you have any reservations about whether our products work in dip or other coatings, don’t! You should know that we were the pioneers who introduced Plasti Dip Pearls to the world. We recommend 1 level teaspoon of ghost pearl per sprayable quart of clear paint/binder, or one tablespoon per pound of clear powder coat. These are all just starting ratios and are adjusted for your specific use.